What's Going to Happen To The Babies Born To Mothers Who Were Infected With Zika Virus? : Goats and Soda The "new microcephaly." That's what doctors in Brazil are calling the birth defect believed to be caused by the Zika virus because it seems much worse than cases that have occurred for other reasons. Dr. Danielle Cruz attends to 4-month-old Davi Lucas Francisca da Paz, held by his mother, Eliane Francisca, in an examination room at the Institute of Integral Medicine Hospital in Recife, Brazil. There's something different about the way these babies cry. That's a realization that hit me after spending day after day with babies in Brazil who were born to mothers who were infected with the Zika virus when they were pregnant. It's not just that they cry more easily, and longer — which they do. There's also something strange — harsher and more pained — about the cries of many of these babies. The realization that they even cry differently than normal babies drove home how many mysteries the world is facing because of the Zika virus. Why would they cry differently? Like so many other things about these Zika babies, no one really knows. But doctors are starting to try to get some answers — from babies like Davi Lucas Francisca da Paz. He's 4 months old. I met Davi, crying in the arms of his mother, Eliane Francisca, in a crowded waiting room at the IMIP Hospital in Recife, Brazil. IMIP doctors are caring for hundreds of babies suspected of having brain damage caused by their mothers getting infected with the mosquito-borne virus when they were pregnant. More than a dozen of these babies were coming in just that morning. Francisca left home at dawn for a two-hour van ride into the city for Davi's monthly checkup. So she and her baby were already waiting on a hard plastic chair for hours. Finally, the pediatrician, Dr. Danielle Cruz, called them. Davi starts wailing again as soon as they start heading to the exam room. Cruz tries to comfort Davi. Davi's head is tiny. He has microcephaly, which doctors think Zika is causing. His brain is tiny, too. It's deformed and scarred in a distinctive pattern that seems unique to babies born to mothers who had Zika when they were pregnant. Davi has other medical problems. His retinas are scarred, so he may be blind. He doesn't have the twisted arms and legs that some of these babies have. But his mother says he recently started having seizures. The convulsions come in waves — over and over again. "It looks like he got really scared. His arms and his legs stretch out. And they get really stiff," his mother says. The seizures last a few minutes, but "for a mother it's an eternity," she says. Cruz reassures her that epilepsy drugs should help. Davi is crying again as Cruz carries him to an examining table. The baby doesn't seem to be deaf like a lot of these babies. So he calms down as Cruz starts playing some calming meditation music on her phone. Hundreds of mothers are showing up with babies like Davi at hospitals and clinics all around this crowded city and other parts of Brazil. As the babies are hitting their fourth, fifth, and sixth months, the seizures are starting, along with other complications, doctors say. Dr. Regina Coeli holds 4-month-old Enzo Thamires in an examination room of the Oswaldo Cruz public hospital in the Brazilian city of Recife. "Every day we are seeing something different," says Dr. Regina Coeli, a pediatrician at the Oswaldo Cruz Hospital, which is located nearby in Recife. Coeli is rushing from one baby to the next. "Some of them they have convulsions. Others have kind of a reflux — vomiting, not eating," she says. As a result, the babies get progressively weaker. "It's very sad. It's a very bad situation," she says. While some of these babies don't seem too bad, most of the infants have really small heads. "They are very small," she says. "It's very grave." Many will be blind, deaf, and severely mentally and physically disabled, she says. Evidence is emerging the virus may also cause a wide variety of serious birth defects. But as bad as many of them are, I realize something else: Once you get over the shock of seeing their heads and hearing their cries, these babies are still babies. They're still cute. "I love them — all of my children here," she says. 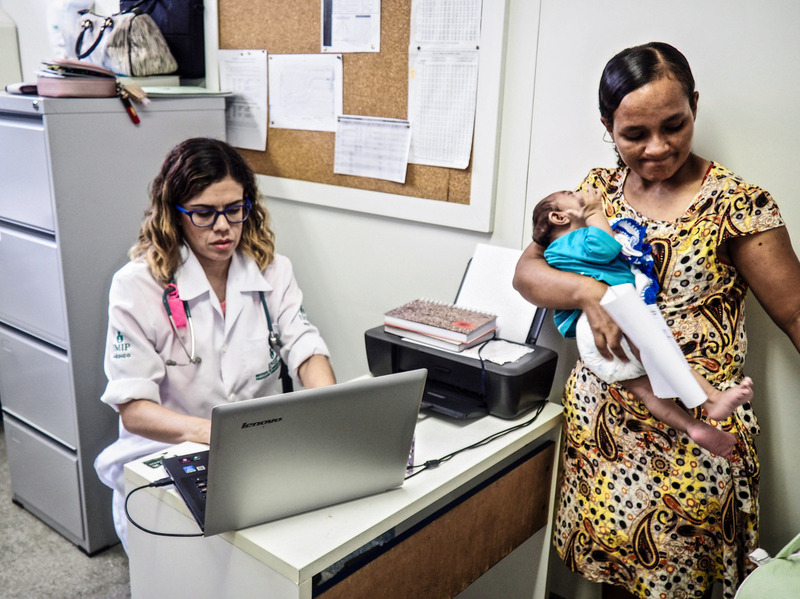 Coeli and other doctors in Recife are tracking these babies to get a better idea of what's going to happen to them as the months and years go by. They know they can't predict based on the microcephaly they're used to seeing. This new microcephaly is "very different," Coeli says. "So we have to study it." The researchers hope they can help mothers and doctors in Brazil and the rest of the world get a better idea of what to expect. How disabled will the children be? How long will they live? What kind of lives will they have? Back at the IMIP Hospital, Davi's mother is finishing up with the pediatrician. Cruz prints out new prescriptions and stamps orders for more tests. That means Davi's mother, who doesn't have much money, had to give up her job to spend days going from doctor to doctor. "I learn to be strong with him. I think these children teach us a lot," she says. She acknowledges that it's exhausting, but notes that a smile goes a long way. "It fills me up," she says. "When I see my son smiling, it's all worth it." As she's leaving, I asked her what she thinks is going to happen to Davi. "It's in the hands of God," she says.